We love rabbits, especially grilled. And we give this one a good grilling. 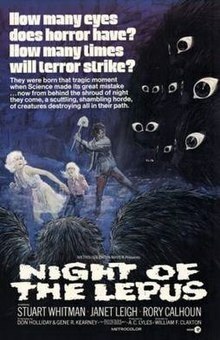 Night of the Lepus features some pretty high wattage star power, including old timey Western star Rory Calhoun, Deforrest Kelley (Star Trek) and Janet Leigh (Psycho). An experiment goes awry, causing oversized bunnies to run amok somewhere in Arizona. Or was it New Mexico? Who cares! How much should we mess with nature? Hubris of man, the laws of nature…all these and terrible jokes featured on this edition of the podcast.